Price includes: 2 hours of bowling, shoe rental, one slice of pizza and a drink. ​This is not a fundraising event. We secure the discounted group rate for our families. ​Flyers will be sent home in your child's backpack. Payment via cash or check. * You do not need to pay if you do not want to bowl. The ticket is for 2 hours of bowling, shoe rental, pizza slice and soda. 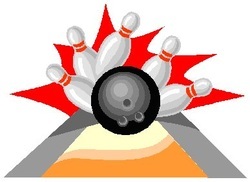 Those not bowling are welcome to relax and watch, but will need to purchase their own snacks if desired. Tickets are non-refundable.